Raising horses and growing up in Moscow, Davenport always knew that she wanted to study animal science at UI, but her focus changed from veterinary medicine to animal genetics when she began studying with Brenda Murdoch, an assistant professor in the College of Agricultural and Life Sciences. Davenport was intrigued by the idea of using genome mapping to identify and understand an animal’s genetics to improve products that come from livestock, so she approached Murdoch about becoming involved in her research project. Now the 21-year-old UI senior can't imagine doing anything else. “I’m really glad that I had the guts to go talk to her about it,” Davenport says. “I discovered that I liked the research side more than the actual medicine. In the beginning, Davenport started by predicting the genetic traits of an offspring based on the parents’ genetics, but then began to go more in depth. Now she can determine an animal’s specific genetic markers. Davenport and her colleagues decide which animals should be breeders, butchered or used for production of things like milk and wool. While Davenport and her team mostly focus on cattle and sheep, they have also genetically tested pigs, moose and goats. This project has greatly benefitted the cattle owned by the university. The research team extracted DNA from each cow and used testing to look at its genetic makeup. This allowed them to determine which cattle have better traits and will produce better offspring, live longer or make large quantities of milk, which in turn allows them to improve the quality of the herd. 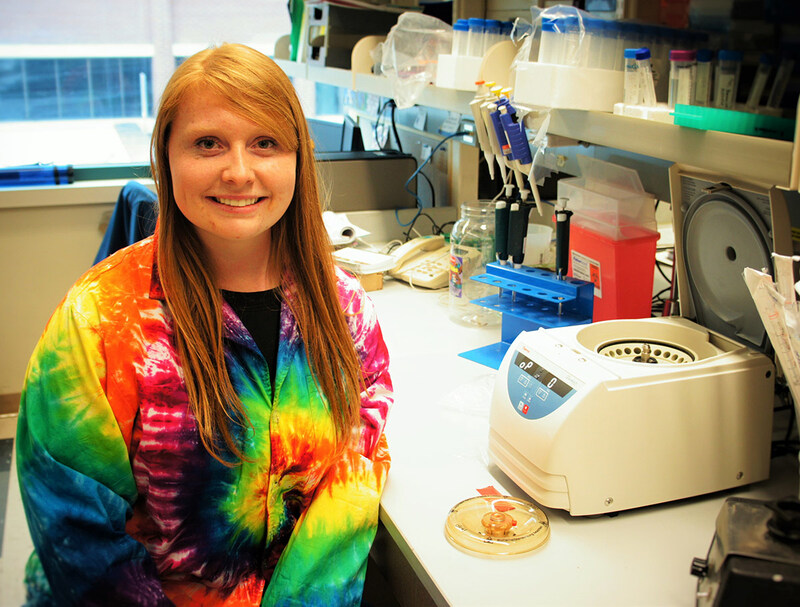 Davenport has been so inspired by her professors and colleagues that she plans to continue her education after she graduates in May and get a graduate degree in animal science from UI. “If my mentor wasn’t so great, I probably wouldn’t have considered doing research,” she says. Davenport plans to inspire her own students someday to go above and beyond just going to class and to join a research project. She wants to be a professor, lead research projects and share her love and passion for research with others. Kimberly Davenport in her animal science lab. Photographer: Sri Sai Sampath Gouru is a freshman and an international student from India majoring in computer science.